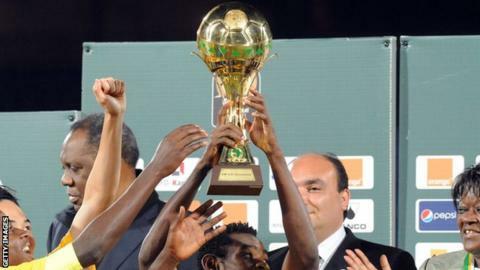 The Under-23 African Cup of Nations kicks off this weekend offering not only chance to rule the continent but also to qualify for the 2016 Olympics. While there will be only one winner of the trophy, the top three teams will book their place in Rio. Defending champions Gabon are absent, having been knocked out in the qualifying round, while other big names like Nigeria and Egypt will be desperate to avoid missing the boat to Brazil. The eight-nation event falls outside Fifa's international match calendar and so clubs are not obliged to release players. Nigeria and Algeria have been rebuffed by European clubs but Senegal and Mali have included experienced local and overseas players in their squads. BBC Sport previews the eight contenders who will battle it out from 28 November to 12 December 2015 in two stadiums - Stade Leopold Sedar Senghor and Stade Caroline Faye - in Dakar and Mbour. The Cubs of Teranga finished fourth at the maiden tournament in Morocco in 2011 and went on to reach the quarter-finals at the 2012 Olympics in London. They may have won gold at the All-Africa Games this year, but coach Serigne Saliou Dia is taking nothing for granted by naming eight European-based players in his 21-man squad. "This is different from the All-African Games because the big teams in Africa will be here with their big stars, including overseas-based players for certain," said Dia. Dia will be banking on home support and hoping for a star performance from highly-rated youngster Ibrahima Sory Keita to fire his country to a successive and second appearance at the Olympics. They will start their campaign in the opening match against South Africa on Saturday in Dakar before facing Tunisia and Zambia. The Amaglug-glug beat neighbours Zimbabwe 4-1 on aggregate in the final round of qualifying. South Africa's only appearance at the Olympics came at the 2000 Sydney games where they suffered a first-round exit. They also failed to come out of the group stage at the 2011 edition of this championship, and coach Owen Da Gama knows a poor start against Senegal could have a negative impact on his side. "This is the match that will define our destiny. We do well here and we are on our way to the last four," said Da Gama. "Pressure will be on the hosts not to disappoint and we will have to take advantage of that. "Our aim is to start well, because negative results will leave us under pressure in the remaining matches." The team is boosted by the South African Premier League's decision to cancel all domestic fixtures for the duration of the tournament to allow clubs to release players. They will need Keagan Dolly, Siphelele Ntshangase, Phakamani Mahlambi and Riyaad Norodien to be at their best as they aim to make history in Senegal. And coach Da Gama will be counting on Rivaldo Coetzee to provide cover at the back. The established Ajax Cape Town and regular Bafana Bafana centre-back did not travel with rest of the squad early this week after losing his passport but has since joined up the team in Senegal. South Africa will get their campaign off against Senegal, before taking on Zambia and Tunisia. The Carthage Eagles may be debutants at the championship but they have represented the continent at the 1960, 1988, 1994 and 2004 Olympics, beating Nigeria en route to the latter. Tunisia easily dispatch Sudan 3-0 on aggregate in the first round of qualifying before edging rivals Morocco 2-1 on aggregate in the final qualifying play-off. Coach Maher Kanzari will be looking to Esperance duo Adem Rjaibi and Haithem Jouini for the goals that will help steer them to Rio. "All the teams have an equal chance, with a slight advantage for Senegal who will be playing on home soil," said Kanzari. "We have enjoyed the best possible preparations and the ball is now in our court to excel by reaching the Olympics." The Chipolopolo beat southern African neighbours Botswana 3-1 in the first round of qualifying before producing a thrilling shoot-out victory against favourites Ivory Coast to book their place at the finals. Zambia made a debut appearance at the 1980 Olympic Games in Moscow but are famously remembered for their amazing feat at the 1988 event in Seoul. Current president of the Zambian Football Association, Kalusha Bwalya, inspired the team to a famous 4-0 thrashing of Italy in Seoul to top their group. But they lost 4-0 to West Germany in the knockout stages. Coach Fighton Simukonda has named South-Africa based Aubrey Chirwa and Lubambo Musonda, who plays for Armenian club Gandzasar Kapan, in his final 21-man squad. Zambia will be hoping to hit the ground running against Tunisia before facing South Africa and hosts Senegal in the final group game on 4 December. The Desert Foxes were the first team to qualify for this year's Championship after a 2-0 aggregate win over Sierra Leone back in July. Algeria are in Senegal looking to secure a place in the Olympic Games for just the second time in their history. Their only appearance came in Moscow 1980, where they reached the quarter-finals only to lose 3-0 to Yugoslavia. The young Desert Foxes are coached by Swiss coach Pierre-Andre Schurmann. Forced to name a 21-man squad of locally-based players, Schurman will be without influential France-based Ramy Bensebaini and Sporting Gijon's Rachid Ait-Atmane. Goalkeeper Abdelkader Salhi feels the opening game against favourites Egypt could help them build some confidence. "We are starting against Egypt, and if it goes well it will help keep our momentum going and qualify for the Olympics," Salhi told the local media. "It is the dream of any player and we will do everything to reach our objective." Algeria will be relying on DRB Tadjenanet striker Abdelhakim Amokrane, who scored both goals against Sierra Leone, to provide their cutting edge. The Young Pharaohs have made the most appearances at the Olympics, having played at the Games a record 11 times. Their best finish at the Games was fourth, twice in Amsterdam 1928 and Tokyo 1964. The north Africans beat Uganda home and away on 6-1 aggregate score to seal a place in Senegal. Placed third at the first edition in 2011, the London 2012 quarter-finalists have been drawn into arguably the tougher group in Mbour and will open against fierce local rivals Algeria on Sunday. Egypt did not participate at the 2015 All-Africa Games football tournament in Congo-Brazzaville, depriving the squad a chance to test themselves against Nigeria. Coach Hossam El Badry is sweating over the availability of Al Ahly midfielder Saleh Gomaa and has named a 22-man squad instead, with one player on standby. El Badry will look to Zamalek striker Mahmoud Kahraba and several players from the senior squad to propel his team to success in Senegal. "I have a target and it is to qualify for the Olympics, no matter what the names of the opponents are," a bullish El Badry told the media. "My team includes many Egyptian Premier League stars and some of them played regularly with the Pharaohs so I am confident that they will perform well." Egypt national team manager Hector Cuper is reportedly planning a trip to Senegal to follow the championship. Young Eagles knocked out title-holders Gabon by wining home and away to seal a 3-0 aggregate victory in qualifying. They will hope to earn another shot at the Olympics having qualified only once - they lost 1-0 to Italy in the quarter-finals in 2004. Coach Cheick Oumar Kone has named a strong 21-man squad including Djigui Diarra, Aboubacar Doumbia, Souleymane Coulibaly, Diadie Samassekou, Souleymane Diarra and Souleymane Sissoko from the Mali team that finished third at the Under-20 World Cup in June. Kone has been able to call up five players from Europe and will be under immense pressure to perform after the country finished third at the U-20 and second at the U-17 World Cups respectively this year. He knows the squad carry the hopes of a passionate nation and will want to ensure they do not crumble under the weight of expectations. "I believe we have not just a strong squad but one capable of making it to the Olympics," said Kone. "All the countries are there for a ticket and it will be tough for all eight teams." The Eagles beat Congo 2-1 at home in the first leg of their final qualifying and drew 0-0 away to advance. Nigeria boasts a proud Olympics record. They made Olympic football history in 1996 by becoming the first African and non-European and South American team to win the gold medal. Their final squad includes Victor Osimhen, top scorer at the 2015 Under-17 World Cup, and Taiwo Awoniyi, who is on loan from Liverpool to German side FSV Frankfurt. But they face an uphill task on and off the field in Senegal after the coach omitted 12 players from the squad that won a bronze medal at this year's All-African Games. Coach Siasia has travelled to Dakar despite the kidnapping of his mother as he seeks a place in Rio. "All I can do is to continue to appeal to the kidnappers to release her unhurt," Siasia told BBC Sport. "It's not easy focussing on the task ahead not knowing the fate of my mother."